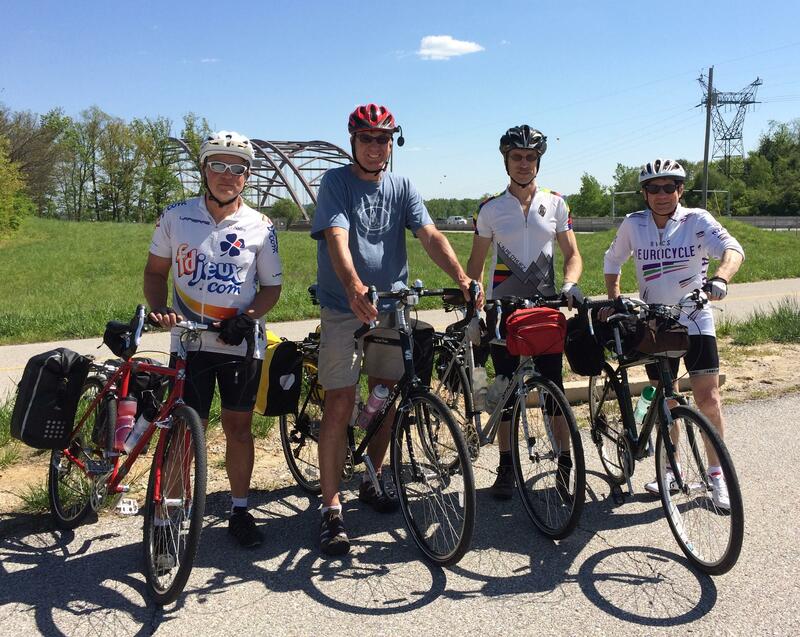 Henry Lazarski (far right) and friends prepare to embark on a week-long ride along the Katy Trail. Just outside St. Louis, Missouri, on a high, windy bluff overlooking the Missouri River, a trio of grey-haired cyclists pump up tires and make adjustments to their bikes while their friend Henry Lazarski paces the parking lot, eager to get rolling. Lazarski, a 73-year-old real estate lawyer from Paris, France, traveled to Missouri to ride the Katy Trail, which stretches almost the entire width of the state just short of Kansas City. At about 240 miles, it’s the longest continuous bike trail in the country. This is Lazarski’s first time in Missouri, and he admits he knows little about the state. The Katy Trail has been drawing increasing numbers of cycling tourists like Lazarski in recent years, and advocates say it now generates $18 million in tourist spending per year. Now they hope to re-create that success in Missouri's northern Ozarks region where the abandoned Rock Island railway line will be converted into a new 145-mile recreational trail. When that’s completed, the two trails will form a loop of more than 400 miles, which would rank among the longest bike trails in the world. But a glut of lawsuits could make the overall cost of the new Rock Island Trail much higher than the Katy’s. As an example of what bike trails can do to boost the fortunes of rural areas, trail supporters point to Bluffton, Missouri. Doug Rendleman runs one of the first B&Bs for cyclists in Missouri near Bluffton. In a quiet stretch of the Missouri River valley, retired construction worker and bass fiddler Doug Rendleman opened one of the first bed-and-breakfasts catering to cyclists along the Katy Trail. Completed in 1990, the trail was a project of the Rails-To-Trails Conservancy, a nonprofit organization based in Washington, D.C., that works to convert abandoned railroad lines to recreational trails. Rendleman says he started looking for property along the railway back when the Katy plan was first announced. He found an abandoned farmhouse for sale and spent years fixing it up. Nights at Rendleman Home Bed and Breakfast often end with sing-alongs around a bonfire, with the proprietor himself on bass taking requests. Far from any city or interstate, Bluffton has struggled in recent years, but several residents have followed Rendleman’s example and started their own cycling-related businesses. Rendleman says spending from cyclists has become a steady and growing source of income for many in the region. About 60 miles southwest of Bluffton, the town of Meta, Missouri, seems like a good candidate for its own cycling stimulus. The northern Ozarks town of 229 residents has been losing population but the Rock Island trail could send a stream of cyclists and money right through its middle. Many nearby residents, however, aren’t happy about the plan. “I just got a hundred acres here. Three-quarters of a mile of track,” says Rodney Luebbering, a farmer, as he drives his pickup down a pair of thin muddy tracks in the northern Ozarks. He points out where the old Rock Island railway line cuts his alfalfa field in half. It’s been abandoned for nearly 40 years and it’s overgrown with trees. Rodney Luebbering says the old Rock Island railway runs through the center of his alfalfa field. Luebbering says cyclists passing through this remote farmland would endanger themselves and the crops. “If the trail goes through, we’ll probably fence it out and start putting cattle down here, ’cause I don’t want to take the risk,” Luebbering says. He may not like the bike trail coming through, but there’s not much he can do about it. In 1990, the U.S. Supreme Court upheld the federal law that allows railways to be converted to recreational trails. The law applies even where the land is privately owned and the railroad only acquired an easement to the land. 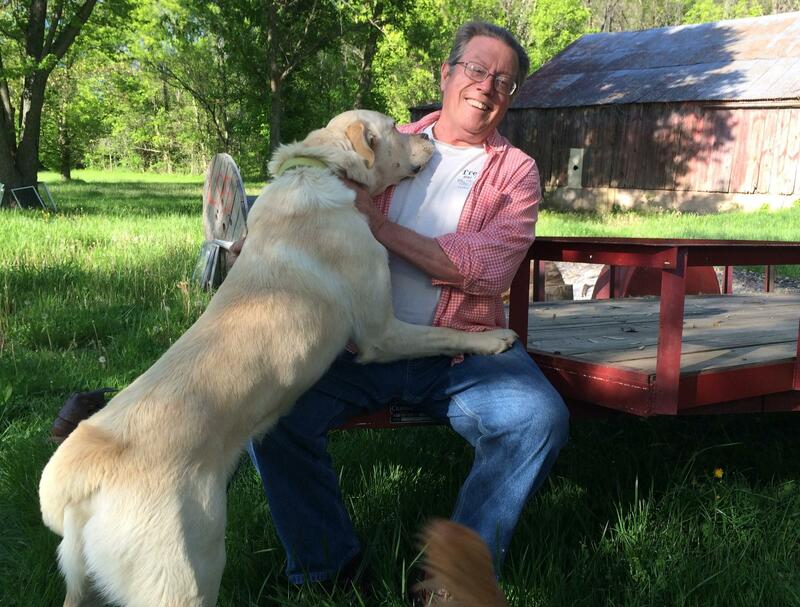 Since he can’t stop the recreational use of the property, Luebbering and hundreds of other Missouri landowners say they should be paid for it. Not long after the federal Surface Transportation Board approved the Rails-To-Trails conversion of the Rock Island line in February, St. Louis lawyer Mark “Thor” Hearne, a partner with the Arent Fox law firm, filed a lawsuit on behalf of 237 Missouri plaintiffs (it has since grown to more than 300) seeking compensation from the federal government. Hearne has been arguing these kinds of cases for nearly 20 years, but he says a Supreme Court decision in 2014, Brandt vs. United States, has made his job a lot easier. The court affirmed what he’s been arguing all along: When an easement’s use is changed, the landowner is entitled to payment. Hearne now represents some 3,000 landowners in multiple suits nationwide seeking compensation for the taking of their property. Some legal experts have speculated that the cases could cost the federal government hundreds of millions of dollars, which would greatly increase the overall price tag of Rails-to-Trails projects. But Rails-To-Trails organizers consider the suits a mere distraction. “That’s an issue between the Justice Department and the landowners,” says Eric Oberg, trail development manager for the Rails-To-Trails Conservancy’s Midwest Regional Office. Oberg says the suits won’t affect trail funding and will have no impact on the trails being built. The ultimate question for many along the Rock Island Trail, however, isn’t how much money they’ll get but when the trail will come through. 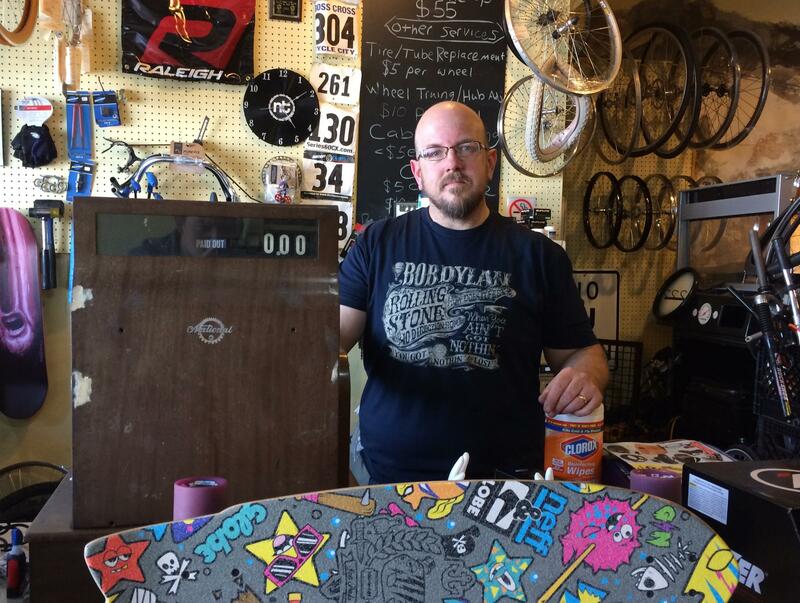 Two years ago, Alan Voss opened the New Town Bicycle and Coffee Shop in Pleasant Hill, Missouri, a former railroad boom town just southeast of Kansas City. The Katy Trail currently ends east of Pleasant Hill, but Voss says he set up shop anticipating the new trail would eventually pass through on its way to Kansas City. Bike shop owner Alan Voss is eager to see the bike trail go through Pleasant Hill. He knows the conversion will be expensive, but he sees the former railway as the key to a healthy future for his town. “The bike trail is being built on those rails and also will be bring revitalization.” He says. In the meantime, cyclists and business owners looking for an economic shot in the arm probably shouldn’t hold their breath. 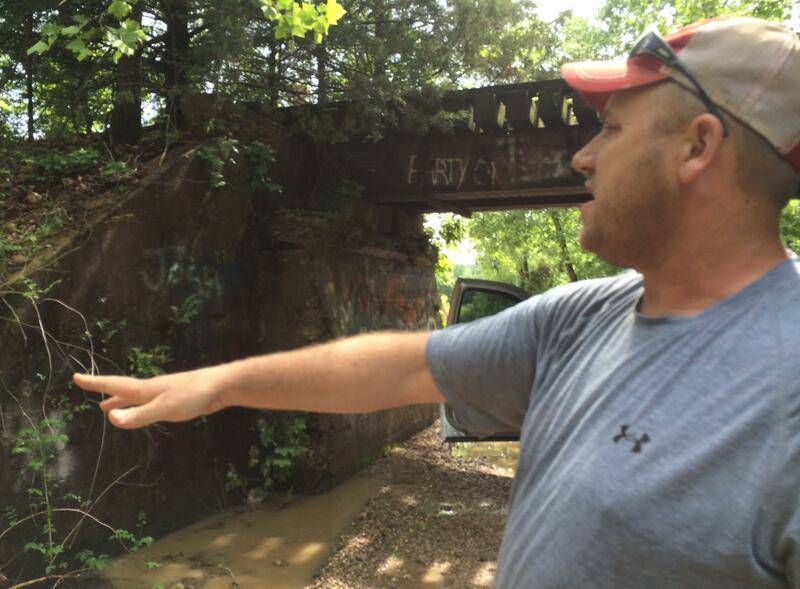 Rails-To-Trails organizers say that completing the new trail may take not years but decades. Alex Smith is a reporter for KCUR, a partner in the Heartland Health Monitor team. A recent federal ruling will help connect the Kansas City metro to the Katy Trail. 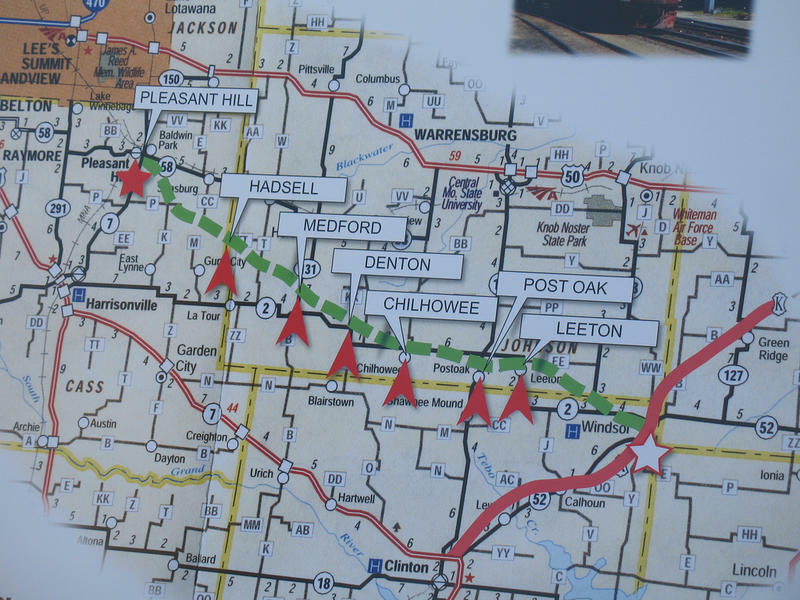 The Surface Transportation Board issued its decision Thursday to allow 144 miles of the Rock Island Railroad tracks to be used as a bike trail. The railroad hasn't been used for more than 30 years. 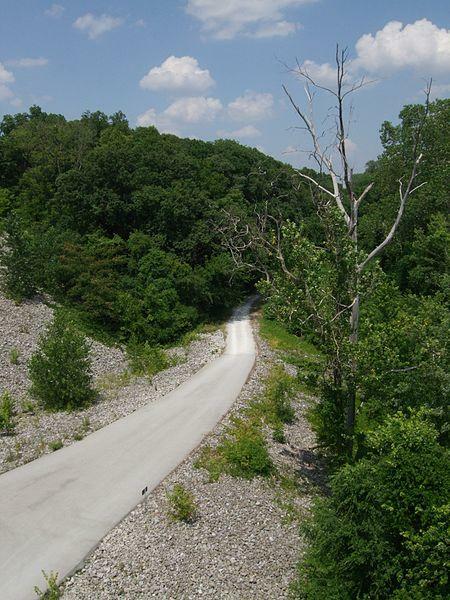 Once completed, it will create one of the longest cycling trail networks in the country. Eric Bunch of BikeWalkKC says the connection will be a boon for both Kansas City and the entire state. 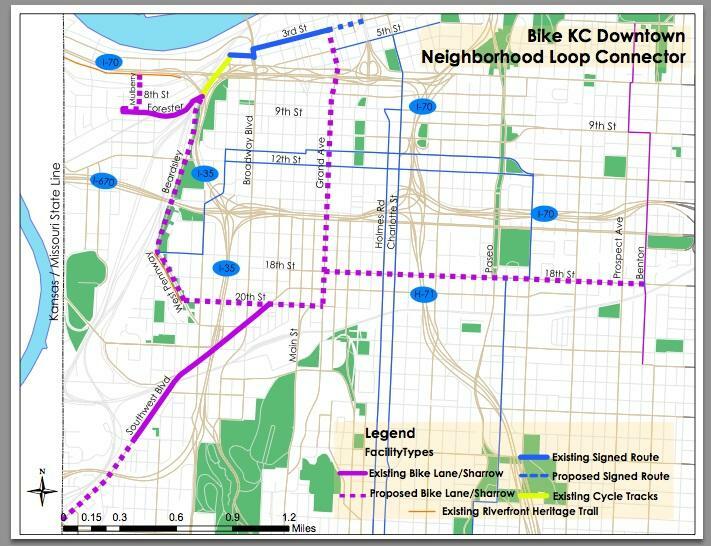 Bike commuters and enthusiasts may soon have more options for safely trekking through downtown Kansas City, Mo. The Public Works Department disclosed plans Tuesday for redesigning traffic flow and creating bike lanes on a mile-and-a-half stretch of Grand Avenue between the Crossroads and the River Market. “It’s an opportunity to take Grand from a traditional 1960’s six-lane arterial into a more walkable, livable three-lane street with bike lanes and better pedestrian accommodations,” said Wes Minder, manager of capital planning for the city. When the Missouri-Kansas-Texas Railroad, known as the KATY, canceled its route from Machens to Sedalia, the railroad’s loss became a gain for hikers and cyclists. The 200 miles of converted rail bed, now known as the KATY Trail, is an economic engine that falls short of reaching Kansas City — but that could be changing. On Wednesday's Up to Date, we find out what’s next for the KATY Trail, and how it might expand. A Kansas City City Council committee has finalized an ordinance making it illegal to intimidate walkers and bike riders on Kansas City, Mo., streets. Maggie Priesmeyer, who volunteers for an organization that helps provide bikes to needy people, was among those who shared stories about rude, intimidating and inconsiderate motorists. She told the Public Safety Committee the story of a homeless, jobless veteran named Joe who came in for for help with bike repairs wearing a sling and brace of the type used to support a broken collarbone.